Will the lunar eclipses of 2015 usher in the year of the Rapture? December 21st, 2010's lunar eclipse was a spectacular heavenly display that had millions of astronomy enthusiasts gazing into the late night hours. The eclipse also had a number of end times watchers speculating if the blood red color of the moon embodied the prophetic significance that Jesus described concerning His return in Matthew 24:29. While we, of course, didn't see Jesus return that night, the prophecy watchers are now looking ahead to the historically significant series of eclipses that will occur in 2015. Are these sky shadows a possible indicator of Christ's return? Saying there's a good chance is Pastor Mark Biltz of El Shaddai Ministries, the Hebrew roots teaching ministry that looks into the Messianic significance of today. 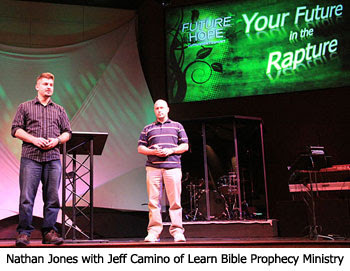 To help explain Pastor Biltz's teaching is one of the newest Bible prophecy teachers on the scene — Jeff Camino of Learn Bible Prophecy Ministries. I had the pleasure of meeting Jeff just a year ago at the Tulsa conference. Since then, Jeff's followed God's call and given up his tech job and life in Kansas to bring his wife and six children down to Texas to start a Bible prophecy teaching ministry. Author of the book Pray That You May Escape, Jeff's shown he has a keen grasp of eschatology and is quite adept at helping people understand Bible prophecy. He's given The Christ in Prophecy Journal permission to repurpose below his great article so that we may be equipped to discern if there is any possible prophetic significance to the coming 2015 eclipses. I invite you to get familiar with Jeff Camino and his ministry. You'll be blessed! "Blood Red Moons and Solar Eclipses in 2015"
You have the religious year beginning with the total solar eclipse, two weeks later a total lunar eclipse on Passover, and then the civil year beginning with the solar eclipse followed two weeks later by another total blood red moon on the Feast of Sukkot—all in 2015. Biltz's claims can be confirmed by looking at a biblical calendar and then NASA's web site because astronomers are able to predict those astronomical events with high precision (not surprising given that our Creator's intelligent design is amazing). "Therefore keep watch, because you do not know the day or the hour." (Matthew 25:13). Still, I am often asked about the topic and, thus, I have been compelled to dig deeper into the theory. The results of my research have been quite interesting (even for those who may have heard about this before). Biltz notes that if we go back in history to examine when tetrads happened previously, we find one was in 1967, when Israel recaptured Jerusalem. Prior to that it happened in 1948, which we know to be one of the most notable prophetic events in centuries: when Israel became a nation! He goes on to explain that prior to 1948 there were not any tetrads at all until the 15th century, but none of those fell on Passover or The Feast of Sukkot. Then in 1493 and 1494, shortly after the Jews were exiled from Spain, there was a tetrad that also synced up with the dates of Passover and The Feast of Sukkot. "So each time it happened it was tied to the Jewish people," Biltz notes. He also points out that other than 2015 a tetrad will not happen again in this century. Upon much closer examination of Pastor Biltz's theory and his calm and studious presentation thereof, I have to concede the possibility that something of prophetic significance may be in store for those dates. It's just too hard to ignore the pattern the Lord has seemingly provided to us. Please read on, as I'll explain that concept in greater detail throughout this article. I'm not even sure Biltz is aware of this, as I haven't seen him mention it in any of his presentations; but one must also understand that God used celestial events in the past when the Christ child was visited by the Magi, and again at His death (which was also a blood red moon). If you have not seen The Star of Bethlehem, I highly recommend you order a copy for yourself to fully understand what I am saying about that. You have to see the video to really understand why I take pause and concede there may be something of prophetic significance related to the tetrad occurring in sync with the Jewish Feasts in 2015. "Immediately after the distress of those days the sun will be darkened, and the moon will not give its light; the stars will fall from the sky, and the heavenly bodies will be shaken. At that time the sign of the Son of Man will appear in the sky, and all the nations of the earth will mourn. They will see the Son of Man coming on the clouds of the sky, with power and great glory." However, if the celestial events of 2015 were to occur immediately after the Tribulation, we must back up seven years from the dates to locate the beginning of the Tribulation. Since the Bible tells us Daniel's 70th Week will begin when the Antichrist comes upon the scene (Revelation 6:2) and confirms a covenant with the Jewish people (Daniel 9:27), then we would have had to seen that event in 2008. Obviously we did not. In fact, there was also no Rapture, which would have been an even more obvious event. Of course, some might contend that I am assuming a couple of theological issues, and I am. Among other things, an understanding of Daniel's 70th Week is essential to understanding that we can not be in the Tribulation now given there has been no confirmation of a covenant nor has there been a Rapture. I can concede that the Tribulation and Daniel's 70th Week do not necessarily have to be entirely in sync, but that does not help with the problem at hand. I have included links to both of those topics, "Reasons for a Pre-Trib Rapture" and "Daniel's 70th Week," at the end of this article [on my website] if you want to study either of those topics further. If the celestial events are not related to the end of the Tribulation and Second Coming, then that leaves a few possibilities. Perhaps they will represent the beginning of the Tribulation. Maybe they will happen at the abomination of desolation, or a major prophetic war involving Israel. If we look to when they happened in the past, then whatever it may be, it suggests we are to be looking for a major event related to the Jewish people. So what is Joel's prophecy all about? We learn about that in Acts 2:17-21, where we read that Peter explained to a group of listeners that those speaking in tongues were fulfilling Joel's prophecy: which foretold that a future generation would prophesy and see visions, that God would pour out His Spirit, and that there would be wonders in heaven — to include that "the sun will be turned to darkness and the moon to blood". Once again, I refer you to The Star of Bethlehem for further insight to how that did, in fact, happen at the time of Pentecost, just as Joel predicted! Thus, Joel's version is not about us now or any future event. Rather, it happened at the time of Pentecost (before the day of the LORD in that context). It should be noted that it was also an event related to the people of Israel because right after quoting Joel, Peter resumes his sermon with "Men of Israel, listen to this..." (Acts 2:22). That brings me to one final place in scripture that must be examined, because Revelation 6:12-14 also describes the sun being darkened ("like sackcloth made of goat hair") and the moon turning to blood. Interestingly, that is related to the opening of the Sixth Seal, which may not be about the Second Coming since many more Tribulation events described in Revelation come afterward. If any of the verses in scripture match, I believe it could be this one. Even if we ruled out that there is no relation between any prophetic scripture referencing the sun and moon being darkened with the eclipses forecast to happen in 2015, I believe we still may have reason to pay attention to the interesting discovery. First, the pattern is quite remarkable, as we have seen noteworthy celestial events when the "Star of Bethlehem" led the Magi to the Christ child, at Christ's death, during Pentecost, when the Jewish people were exiled from Spain in the late 14th Century, when Israel became a nation again in 1948, and when Israel recaptured Jerusalem in 1967. If that pattern continues, then we can expect that 2015 will also have major prophetic implications for the Jewish people. their words to the ends of the world'"
I don't think it can be more clear: we are to pay attention to prophetic signs, we should be ready and on the watch, and we must acknowledge that the heavens have signs for us as well! I began this article by providing a brief overview of Mark Biltz's finding, then cited verses that remind us that nobody knows the specific time of Christ's return. I then examined how Pastor Biltz has uncovered an amazing pattern wherein a major event related to the Jewish people happened each time there was a tetrad that year and I provided you with further evidence that God has, time and time again, used celestial events to point to earthly events. I examined why 2015 can not be related to the Second Coming, yet explained that we should still be paying attention to the tetrad in 2015. I then provided some scripture that clearly warns us to be ready and watchful — to include paying attention to the heavens. Note: In no way does the possibility that some major event impacting the Jewish people in 2015 influence the imminence of the Rapture. Since the Rapture can occur at any time, with it not being necessary that any event precede it, the fact we are seeing end-times signs (a looming tetrad; wars and rumors of wars; earthquakes and other natural disasters; worldwide economic stress; technological advances; etc.) just brings us all the closer to the end times and, therefore, we can, more than ever, expect the Rapture at any moment! The original article can be found on the Learn Bible Prophecy website. Great article. I have followed Mark Blitz teaching on that and the Star of Bethleham video and am amazed that God is so loving that He even writes warnings in the skys for us. I don't believe we should set a date, but we can not overlook 1 Thess 5:4 But you, brothers and sisters, are not in darkness so that this day should surprise you like a thief. So we should know it is coming soon... and I think that is what He is telling us in the skies. The DVD you mention, The Star Of Bethlehem, is one of the most wonderful presentations I have ever seen. I send a copy to my best friend in California, and to my lady friend here in Louisville, Kentucky. God, in all His majesty, Maker of all there is, gives us signs and wonders through the ages which point us to unique happenings in the Jewish world, which is also the believer's world. I think the events to happen in 2015 must hold some messages first for our Jewish friends, to bring them back to the worship of GOD Almighty, which they mostly neglect today. This is the time of the end. Oh dear, this bothers me. I have watched this stuff. Line up or no, I cannot accept the star was a couple of planets. When the moon is in front of me, as I walk toward it, I never get any closer, it's always ahead. It isn't possible for a celestial object to 'stand over the place'. I am convinced the 'star' was the Shekinah, the visible glory of God. Sometimes LIKE fire, others like cloud. Israel hadn't seen it since it had left the Temple by the back door centuries previously. No wonder they were amazed. As for the blood moons! Hm, the thing is all of Israel's festivals are geared up to the moon. It stands to reason when they occur it will be on a festival. I think the reality is far better than the theories. I shall now 'duck'. Nathan said “Among other things, an understanding of Daniel's 70th Week is essential to understanding that we can not be in the Tribulation now given there has been no confirmation of a covenant nor has there been a Rapture”. I THINK I have this sorted in my noddle? The FIRST HALF of the 7 year Tribulation is 1,260 days or 3 ½ years or 42 months. From the very FIRST DAY that Daniels 70th Week begins it is going to be very busy. START! This begins when the Restrainer is taken away in 2Thess2:6,7. AND the ‘falling away’ AND a/c is revealed by signing the Covenant in Dan 9:27. There will be very little doubt that the 70th Week has actually begun imo. "There will be very little doubt that the 70th Week has actually begun imo." Yep, I am of the same opinion. I see no significant covenant or treaty and no Temple. No seals yet. It has recently hit me, that apart from the signing of the Covenant, TWO Jewish gents letting rip with 'Elijah' type ministries in Jerusalem won't go un-noticed. Calling down fire onto their enemies will be a dead giveaway! As their ministry is the full length of the first 3 1/2 yrs, from day one, they will be a thorn in the side of a/c. I am wondering if the disasters they will cause are in addition to the effects of the seals, or are they part and parcel of them? PLUS 144,000 Jewish blokes all around the world as ministers of God causing a worldwide revival - also from day one, will be a big eye opener. These are the last days 'Jacob's sons' from Genesis 49:1-2. ‘The Time of Jacob’s Trouble’ suddenly makes more sense now. When the Patriarch Jacob was ‘in the flesh’ and in trouble with God. God would call him ‘Jacob’. When Jacob was in blessing and fellowship, God called him Israel. So the 144.000 are the ‘Firstfruits’ of to be re-born, Israel (nowt to do with the Church). I THINK they end up in glorified bodies as they follow the Lamb everywhere – even in heaven, but I may be wrong about that? Sorry to keep on, I am SO hungry to understand. Any more thoughts on the above rg? Not my article, E.I., Jeff's. The Bethlehem Star video left me wanting. It was amazing that everything in the sky lined up just right like the big celestial clock that it is. The science seems unrefutable and in order. The wise men would have recognized the signs and probably knew to go to Bethlehem Ephrathah due to Micah's prophecy (Mic. 5:2). But, that the star didn't shine onto the manger seems to go against all the nativity imagery we were raised on. Still, if there was a star shining on Bethlehem for two years or so, Herod would have come a lot sooner. It took the wise men to explain it to him. So a light shining longer than the first night or so of Jesus' birth would not have made sense. Dr. Reagan would agree with you that the star was the Shekinah glory, E.I. EI, some scholars think the Two Witnesses show up in the second half of the week. I think that’s unlikely and John Whitcomb argues compellingly for the first half. But whatever half it is, I think they will be an addition to the seal judgments and also agents of God’s wrath. Just saw this posted at another forum…. I’m not sure about the 144,000 ending up in glorified bodies. I have Dr Robert L Thomas’ 2 Volume Expository on Revelation. I’ll have to check out what he thinks. One thing I am sure about – they ARE evangelists. They are described as “bondservants” or “doulos”, just like John is. The star appeared in the East – they didn’t follow it, they knew they had to go to Jerusalem. It was then that the star reappeared and shone ‘over the place’! Daniel was made head over the Magi, who were into some dodgy stuff; it is likely his new broom swept aside the occult. We know King Neb became a believer, so did SOME of the Magi. Then Zorro (Zoro aster ??) started a new religion, some Magi followed that, others kept to the old religion, some became believers in Daniels God. All ancient kings had a group of Magi, they were very powerful, called the King makers or breakers. That’s why ALL Jerusalem were troubled because Herod was dying, so was Caesar and they thought ‘uh, oh, here comes trouble’. It is thought there would have been a troop of several hundred Persian Cavalry with them – oh – and the Magi NEVER rode camels, always horses. Arabs steeds I ‘spect? The arrival of the Magi meant the rise of a new King. These Magi would have had at least the books of Daniel and his other books such as Jeremiah; they knew the Messiah of Israel had come. The ‘King Makers’ loudly proclaimed, by their very presence, that The Messiah of Israel had come. The one thing they didn’t know was the exact location of the new King – which is why the Shekinah of God ‘stood over the place’. There are remnants of the Magi in the N.T. Simon Magus and another, but I forget. That’s fascinating about the Gospels, and it’s so obvious now you have told me. The 2 witnesses minister for 1,260 days then they are killed in the middle of the ‘week’; so I can’t see how they get the last half? That’s interesting, as their ‘miracles’ are an addition to the seals, then from day 1 of the 7 years a lot of nasty stuff is going on. Just thinking how some say the first 3 ½ years are ‘peaceful’, I just don’t see how they can even think it. I agree the 144,000 are evangelists. Postie says not, they claim the Church has to be there to preach the Gospel. However, it’s the Gospel of the Kingdom that Jesus preached that goes into the whole world from my understanding. Apart from the 144,000, AND the 2 witnesses, there’s a Gospel Angel that flies around the world witnessing. Another reason why the Church doesn’t have to be in the 7 years. It may just be me, perhaps it is, but I have found eschatology is getting so much clearer. The few queries I had from the other timing views have all been answered to my total satisfaction by various teachers and scholars. My personal eye-opener has been to realise what a vital part Grammar plays. I wasn’t taught much at school, we just ‘did it’; we weren’t given much explanation to how it works. Grammar plays a huge part in Greek, it’s no wonder there is so much variety of opinion. I may be wrong about the 144,000 being in glorified bodies; I came to that conclusion without any solid backing. I look forward to see if you find any notes on it. I have made a note of the links; I shall really enjoy looking at them. I'm not sure the 144,000 will ever have glorified bodies. Since they're sealed to survive the Tribulation, they'll pass the Sheep-Goat Judgment of Matt. 25 and live on into the Millennial Kingdom in their earthly bodies. The Bible's rather silent on the fate of the faithful who live through the Millennial Kingdom, whether they'll receive glorified bodies at the end or live on into eternity in their human bodies. Because eternity is perfect, I side with LaHaye that they'll get glorified bodies at the end of the millennium, (but then why do nations need healing - Rev. 22:2)? I don't understand that one either? I expect I have it wrong about the 144,000. I hope I didn't give the impression that I think I know everything about end time prophecy - I wish! Its the TIMING issue of the Rapture I am content about. I've still got questions, but the TIMING of the Rapture is without doubt PREtrib, and its definitely IMMINENT! Another thing I am absolutely sure about - once we are born again, we cannot become un-born. It takes faith/belief, and the word is 'pistis'. Its secondary meaning is 'assurance/guarantee' in one package. To have faith/believe on Christ Jesus for salvation is to have the assuranceguarantee signed in His own Blood. I was an eye witness to the certain Salvation of my lads. It's done! That gives me peace. Has anyone read the letters to the 7 churches? There is a massive clue there, that Revelations is actually over TEN YEARS, not 7 yrs. Look at the Smyrna church (Rev 2v10), it says 'for ten days you will have affliction'. Sometimes a day is equal to a year, so that makes 10 years. So using signs in the sky. I have deduced that the Great Tribulation has already started in Apr 2008 and the first Seal was broken in January 2009, the forth in Dec 2010. And I believe the 6th seal will be a dual sun and moon eclipse in early 2013. What is so special about April 2008? It is that, it is 40 years to the day since the first Jewish settlers arrived in Hebron, at the Lunar eclipse on 14th April 1968. This is the leaves growing on the fig tree, signifying Summer. This was also my birthday. April 2008 is also special as it is 60 years since Israel became a nation. But you must remember all the timings can be delayed right up to the 6th Trumpet, so this is all up to God's timing. Also there is a code of years in Psalms, for example Psalm 1 is equal to 1901. In the NKJV Psalm 219 is equal to 2019 and it is not only the longest Psalm, it has the Hebrew alphabet starting some verses. As if to say look at me I'm a special Psalm. Maybe this is the year of Jesus' return or at least it may start Jesus' Golden Millenium. Total stuff and nonsense! The plain text of God’s Word has spoken to The Church since the Canon of Scripture was CLOSED 2000 years ago. Long before Gematria was known and subsequently abused, as these vain efforts display. The secret things belong to God, and unless you are HE, and obviously you aren’t, you know nothing of the kind. Daniel 9:27 Daniel 9:27 Then he shall confirm a covenant with many for one WEEK; But in the middle of the WEEK He shall bring an end to sacrifice and offering. And on the wing of abominations shall be one who makes desolate, Even until the consummation, which is determined, Is poured out on the desolate." A WEEK or a ‘shavuah’ (seven) which is a period of ‘seven of something’, in this case it’s prophetic years of 360 days in length. It’s a ‘heptad’ a week. Such as the ‘Feast of Weeks’ the length of which is plainly SEVEN, certainly not ten. Considering the words of Jesus that NO-ONE, not even The Son of God knows the date of His return as ONLY The Father knows when, which beggars the question, are you the Father? Ridiculous!. Mark 13:33 (Jesus said) "But of that day and hour NO ONE KNOWS, not even the angels in heaven, nor the Son, but ONLY THE FATHER. 14. Take heed, watch and pray; for YOU DO NOT KNOW when the time is. The plainly written Word of God reveals this attempt at ‘knowledge’ is nothing but deceptive smoke and mirrors trickery. That’s the second time in as many days I have been presented with this --- numerology. Truly we are in the last days as the deception increases. Repent from this philosophy of man, and get right with God – Jesus is coming back! I personally think the bible will be fulfilled literally.And what that means is ..there must be a falling away first and the man of sin be revealed.Believers will know who he is before everyone else,thats why we will be delivered up as sheep to the slaughter and killed for our testimony..this is the 'great tribulation' ..not the wrath.. we are not appointed unto wrath..Gods wrath that is.The Day Of the LORD is witnessed by different people at different times ie. joel,daniel,isaiah..but ONE particular day. Joel says the eclipses happen before the Day of the lord .Also this is the day of the rapture ,because as soon as we get to the throne of god with our palms in hand ,BOOM a war breaks out in heaven and the 'stars' that fall like figs are fallen angels come down to make the land desolate 'they have the appearance of horses and so shall they run'.Then the 4 angels that are bound in the great river euphrates are let out of their cages that they may perform Gods wrath on the unbelivers.since the bottomless pit is opened ,the king Appollion will posess this antichrist and kill the 144k who were sealed at the time of the rapture and the 2 witnesses and stand in the newly built temple,by now the jews who mourned with jealousy when they saw jesus comming on the clouds to take his gentile church and the door was shut,now flee to the mountains were God feeds them for 1260 days away from the beast.They are no longer 'blinded in one eye'and read the new testament and Finally 'get it' and worship God the Father AND JESUS THE CHRIST the son of the living God and our savior.GODS HAND IS STRECHED OUT STILL. Say what about the length of the Tribulation and it's start date? From your birthday!?! The length of the Tribulation is clearly described in the Bible as being seven years long, described in a variety of ways as "one seven" year block (Dan. 9:27), half called "times, time and half a time" (Rev. 12:14), consisting of two "1260 days" periods (Rev. 11:3), or two "42 month" periods (Rev. 11:2; 13:5). E.I. 's got it right, the Tribulation begins with the signing of the covenant between the Antichrist and Israel (Dan. 9:26-27), and so the Tribulation hasn't begun yet. That's a good thing, right? The day of the Lord isn’t a technical 24 hour day. Where it’s called the great and terrible day of the Lord it refers to the day where He appears at Armageddon. However, Isaiah 2 shows us that in a broader sense it includes the 6th seal. And 1 Thess 5:2-3 wouldn’t make sense of anything that comes after the seal judgments. There isn’t any verse that says the day of the Lord and the rapture are simultaneous events. People read that into 2 Thess 2. God’s wrath isn’t restricted to the day of the Lord either. The great tribulation and Satan’s wrath and the seal judgments are all initiated by God. Therefore we cannot say God’s wrath isn’t there. The two witnesses are also extensions of God’s wrath (Rev 11:5-6) because God empowers them. The latest they can turn up is at the middle of the week. God’s wrath must be part of the great tribulation which is 42 months because the Antichrist is only given 42 months of authority and at the 6th bowl he gathers the armies for battle. The 2015 phenomenon could possibly herald the initial phase of the Great Tribulation or the final three and a half years of the Time of Jacob's Trouble. I believe in addition to many others that this is a significant moment, however it could also prove difficult when we realize the AntiChrist will seek to change times, and seasons. I believe that our time is extremely short, we are on the threshold of the end of the Church Age. I pray we remain steadfast in the faith and strengthen what remains that we not lose our crown. The finish line is on the horizon and our race will soon be complete. Praised be the Lord God that we are heirs of salvation not subject to wrath. I understand ‘to change times and seasons’ directly involves the Calendar of the Jewish Feast’s. However I certainly agree with the second paragraph. The Church is exceedingly close to being finalised and we are not appointed to Tribulation wrath. Whether or not we choose to accept the possibility, it should be clear that something momentous is about to occur very soon. Reports throughout the globe of large fish kills, birds falling out of the sky dead, octopus, crabs, cattle falling dead in great numbers, suggest the presence of polluted water sources and toxic fumes being projected in the atmosphere. Haggai 2:6,7. For thus saith the LORD of hosts; Yet once, it is a little while, and I will shake the heavens, and the earth, and the sea, and dry land; And I will shake all nations, and the desire of all nations shall come: and I will fill this house with glory, saith the LORD of hosts. The widespread deaths of the birds of the air and the fish of the sea suggest the earths crust has been opening releasing gases. This has resulted in deaths of bottom feeding fish and the birds that roost on the surface of the waters. Once these birds take flight the toxic residue left from the gases forming on the surface of the water enter into their lungs and they collapse in mid flight. I personally believe all the evidence presented suggests a global earthquake unlike any ever recorded in ancient or modern times. If this is possible, we should see further evidence of wildlife mysteriously washing up on our shores and falling from the sky and the poisoning of water sources used for cattle from sulphuric gases. Time will tell, I will continue to watch and pray. It appears north east Africa is cracking up and sinking, only a few hills, and a lump of fresh magma stops the Red Sea from pouring in. It is happening very fast, it will become another sea before long. I wondered if its in prep for the Mill when the waters flow out to sweeten the Dead Sea and to the Med, but it could involve this new Sea? Scott Sykes Update. Scroll down to In the News Earthquakes 20th Jan 2011. Prayer please my back is cracking up too, can barely move and painful. Will do Sue, my Pastor's wife is also dealing with degenative bone disease in her spine, she is in constant pain. The doctors say there is not much they can do to relieve the pain or the numbness in her limbs yet God is a miracle worker and a Great Physician. I will keep you both in my prayers. Of all the theories out there for the mass animal deaths, I hadn't heard the one about toxic gases released from under the earth, Rodney. And yet, that one makes the most sense, especially knowing the massive earthquakes the earth is expected to have during the Tribulation. Maybe these animals are the canary in the coal mine? Thanks for that insight, Rodney! We'll be praying for relief for you, Sue. BTW, the next "Christ in Prophecy" Eric Barger interview series will mention you (generally) and your Emergent woes. Thank you also for that forecast Rodney; I agree with Nathan, it’s the most likely reason and SO encouraging that we are nearly there. Nathan! I am really glad; I felt so isolated, there must be other parents out there with grown up children who have turned into strangers. It should help to know they aren’t the only ones. You made a huge, huge difference, to me; just knowing you knew what I was talking about helped. Half the time my reasoning sounded gibberish, totally bizarre, but that’s because this stinking teaching is right up the wall. It’s just like being in an episode of ‘Dr.Who’ with time and sense shifting in and out of reality. Some time ago, I tried to email Eric Barger, but I didn’t know where to start. I am thankful he isn’t letting it lie. Even more thankful that you were willing to put up with me. When the Glory of the Lord was present on Mount Sinai the earth quaked, when Christ was crucified the earth quaked. When Christ was resurrected the earth quaked. When the Lord God reveals himself to my brethren in Israel during the Gog/Magog battle, the earth will quake. When the Two Witnesses are called up in the presence of the Lord, the earth will quake. Finally when the Lord returns and sets his feet upon the Mount of Olives the earth will also quake. I believe that very soon we will experience a global quake as identified in Ezekiel 38. Been praying as well. How's your back, Sue? Glad to be of service, Sue! I wouldn't want you thinking you were living in a traveling phonebooth. Same as RG, how's the back? Its only got a little squeak now; it's stopped roaring, Praise The Lord! Its my own fault, I either sit too long or stand too long. Coo, it made I sweat, it had a fierce bite. Very insightful article, but the final sentence ("Since the Rapture can occur at any time, with it not being necessary that any event precede it,...we can...expect the Rapture at any moment!") is (#1) tautological and more importantly (#2) false. Please review 2 Thes 2:3. The rapture will not occur until after the apostasy and the revelation of antichrist. Vs.2 that you not be quickly shaken from your composure or be disturbed either by a spirit or a message or a letter as if from us, to the effect that the day of the Lord has come. 2.Logic a proposition or statement that, in itself, is logically true. Starting at 2Thess2:3 is bound to cause you confusion. You have bypassed the context in vs 1. which is ‘the coming’ i.e. the Rapture, which is when the Thess. would have expected their dead in Christ to arise first – but didn’t. Why hadn’t they been resurrected? because the day of the day of The Lord’ in vs.2. was NOT present. By Jumping in at vs. 3 you have missed the reason for Paul’s letter. Paul found it necessary to reassure the Thess. because they had been deceived, they hadn’t missed the Rapture’, so therefore the Roman persecution they were facing could not possibly be the Tribulation . BECAUSE they would be gone in the gathering before then. See, that was a teaching moment. Pre-Tribbers are tautologically challenged. No wonder they can’t get it right! I’ve previously linked to Eric Douma’s commentary on 2 Thess 2. I think David Guzik does a neat job as well. Nice response EI. Good to hear that you’re better. I confess I still don't know what 'tautawotsit' ACTUALLY means. I lives and I learns - sometimes. Eric Douma is ACE; above my head, but I really appreciate trying to reach for it. I didn't want to get into Prerats, but it has a way of forcing itself into where I am, so I feel obliged to follow through. Have you tried Eric's Logic? I have had a go at practising - but really and truly, I'm not ready to go public for some time yet. NOW I am off to check out David Guzik, I missed that one. In Revelation 12 the dragon is Satan, and the woman is Israel who gives birth to the male child - the Messiah Jesus Christ. Too true, Val, that nobody who has accepted Jesus as Savior will be going to Hell (Rev. 2:11; 20:6). But, beware Ronald Weinland and his Worldwide Church of God teachings, for he's a false prophet. The whole idea that Jesus is God came about at the Nicean Conference in 325. It was codified through a vote required by King Constantine to standardize the belief. Constantine did not care one way or another but he called the conference to unite the empire around one faith which became the state religion. Anyone who dared to go against the interpretation that was accepted would be either excommunicated, exiled or executed. So I guess that is one way to instill the fear of God. So everyone for the last 1,700 years has based this interpretation of Jesus on what was agreed upon. Does that mean that Jesus is not the messiah. No. In fact it is more along the line of the faith Jesus was born into to. Sorry folks, but Jesus was a Jew and so was John his cousin. The messiah according to Judaism means anointed one. They felt the messiah would be a man and probably a king. Jesus did come as the King of the Jews. The idea he was meant to be butchered is ridiculous. So go bath in the blood. It was murder of an innocent man, pure and simple. Read the trial of Jesus. Pilate wanted nothing to do with condemning him. Dah. I suppose the soldiers who nailed him up should be Christian saints with this stupid interpretation. Kids are traumatized at a young age with this. No wonder children should never see the Passion of Christ. The way Christians talk today is they would be able to identify him when he comes. Well, the Jews couldn't because he came as a man and will be born again as a man. I go to a Methodist Church and what gets me is how Christianity has packaged Jesus so it feels comfortable. I walk past pictures of him and they make him out to be 6 foot, ash blonde with blue eyes. It just goes to show how stupid the interpretation of Jesus is. Jesus said it best when he warned those who came in his name yet did evil. Get away from me you evil doers. Some are lining up to be the first. We also know what he said about those characters. However, I have a question for you- If the Messiah asked YOU: "When I return, will I find FAITH?" or did He ask the question KNOWING that after YEARS of torture and torment, 'rapture' hopefuls would LOSE THEIR FAITH? Make sure you are not lying to yourself, before you address me. Lastly, the Messiah is clear when He uses a given term, he uses 'Jew' in Revelation, (but not concerning the Buck'44). No, the MOST Jews involved would be the allotment covered by Judah, then Benjamin, and Levi- perhaps half of Ephraim. Certainly not the extent of the cadre involved. Anonymous, you're missing the historical context of the Nicean vote. The divinity of Christ was voted on to put an official end to the false teachings that He wasn't divine. Those who teach that Jesus isn't the Son of God (as He says in Scripture He is - Jn. 10:3) can't be called a Christian, for they have nothing to believe in that saves them from their sins and puts them right before God again. Without Jesus' death on the cross, there is no salvation for our sins (Heb. 9:22). Howard, my answer is at Why I Believe in a Pre-Tribulation Rapture. “Immediately after the tribulation of those days the sun will be darkened, and the moon will not give its light, and the stars will fall from heaven, and the powers of the heavens will be shaken. 30Then will appear in heaven the sign of the Son of Man,Matt. 24:29 (ESV)Mark Biltz is biblically correct and your PT Rapture theory is biblically wrong. Nathan, someday you will: Zech 8:23 Thus says the Lord of hosts: In those days ten men from the nations of every tongue shall take hold of the robe (wings/Tzit-Tzit) of a Jew, saying, ‘Let us go with you, for we have heard that God is with you.’” (ESV) Your knowledge of the Greek language and Western/Greek culture clouds your judgment. Our Jewish Melek/Tzadik will soon return and reign in the only governmental system preferred in the Holy Scriptures: Torah! This will be a blessing! Hey Joel, you are correct about Zech 8:23 except for one little thing. God is already with me. Also, The Jewish nation will be ruling over the earth, the physical portion of the kingdom. What about the spiritual portion. That is the portion the nation of Israel rejected and the Lord then offered to a nation producing fruit therof. Matt 21:43. The parables in Matthew give a very detailed and chronological view of the "Kingdom" of heaven. Kingdom meaning where authority is delegated from. Also, I think there was a previous post saying Christians wouldn't suffer fire. I suggest you study out I Corinthians 3:1-15. ouch! Hebrews 10:26-27.ouch again. Ther is a whole host of scripture dealing with wayward believers. The list is quite extensive. Rev. 3.3 says you can know the day and hour of the Lord's return. I am still reading Mark Biltz's book. He only states that Sept 14, 2015 is the DRESS REHEARSAL of the event, NOT the event itself. The Event itself is so powerful an occurrence that its dress rehearsal will cause major things to happen. My opinion: Yeshua prophesied in Luke 4 from Isaiah 61, that a world wide debt cancel- ling Jubilee will occur. This Jubilee is NOT with the Rapture, it is the destruction of the efforts of British Empire to bring about world government. Banks will fail. Politics world wide will change briefly, then peace to evangelize the world. The Phoenix bird will die in flames and rise from the dead. Global Fascism will come back to life. Then the Rapture occurs, who knows when? The blood red moons foretell of war for Israel. A solar eclipse on Rosh ha Shanah 09/14/15 has never happened before, look it up. The World – In 1492 the Jews were expelled from Spain, the Spanish officially discovered the Americas, and the Jews spread out to live in many new countries. This worldwide diaspora included the United States, where eventually there were more Jews than in Israel. Within one year of these historical events there was a holiday tetrad of blood moons in 1493 and 1494. The Nation of Israel - Israel was re-established as a nation in 1948, and within a year of this independence there was a blood moon tetrad on the Passovers and Sukkots of 1949 and 1950. The City of Jerusalem – Israelis reunited all of Jerusalem under Jewish rule after recapturing East Jerusalem and the Temple Mount in 1967. Within a year, there was a similar tetrad in 1967 and 1968. The Temple – Some Israelis have wanted to build a new Jewish Temple on the Temple Mount ever since 1967. With Hamas rockets being fired from Gaza into Jerusalem as I write this, the possibility exists that one could destroy the Dome of the Rock Mosque. If it is destroyed, whether by war or a fanatic or any other cause, such destruction would remove the main obstacle to Jewish claims over the entire Temple Mount. Or perhaps the lost Ark of the Covenant is discovered, prompting the establishment of a Temple to properly house it. My research points to the reestablishment of some form of Third Temple in Jerusalem no later than June 6, 2016. This would be within a year of the tetrads of holiday blood moons in 2014 and 2015 and seems to fit the increasingly focused geographical fulfillment of prophetic events near blood moon tetrads." The space between these blood moons is 6 months 666.